I’m wearing it with my Showgirl fully-fashioned tights from What Katie Did, and my getting-rather-old pair of winter booties I bought from New Look a couple of years ago. Whilst not exactly accurate repros as they have a wedge heel, the suede and faux fur cuff definitely harks back to the overshoes of the 40s. I will cry when they wear out! Here’s the whole outfit… obviously a cardigan was essential for the season, too! Without the arty-farty flare effect you can see the richness of the velvet. 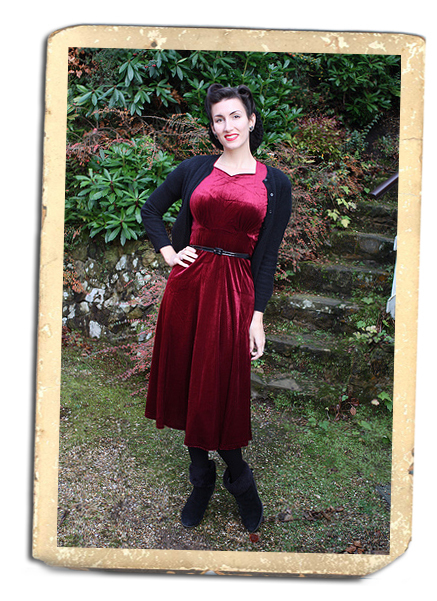 I am now totally torn about which of my lovely frocks to wear on Christmas day! What are you wearing? Chrimbo felicitations one and all! That dress is beautiful! Such a rich colour. I love the booties too. I like the idea of something that doesn't require a belt for Christmas day! Wow! Lovely dress, you look great in it. And the booties are cute! gorgeous dress and the lens flare adds a nice dreamy quality to it. That dress is gorgeous and so christmas-y!!! I'd wear that if I had one! lol. I am wearing a 60's dress in jewel toned plaid/check/tartan. 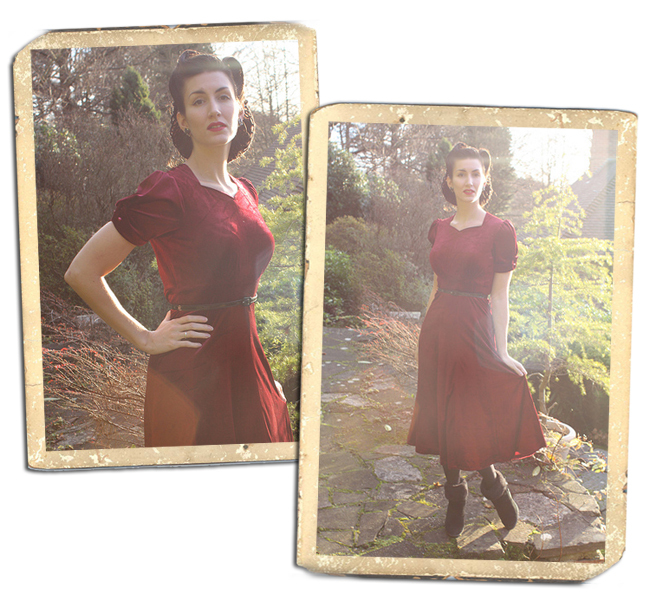 Such a lovely colour dress, the sleeves and neckline shape are really nice. I love the boots too! I am wearing my sarong style barkcloth dress which I made last month, doesn't sound too festive but it is red, white and green! Pairing it with some early 50s green velvet heels with diamante trim. Do you find the tights to be warm? I'm looking for some warm tights for the Chicago winter! You look beautiful, great color for you! What a lovely dress, such a beautiful colour, and cute booties too! That deep red really suits you, you lovely creature! I picked up a late 50's red satin dress at a movie studio costume sale for $15.00. A wee bit of tailoring, plus a glittery black cardigan and heels, and my outfit is done! This is for a military dinner at my sweetie's armoury, so I can go fancy. Those boots made me squeal when I saw them – Too darn cute. Betty Lou: Have you seen the cute suede wedges at Clarks now? I am coveting a pair! Glamour Daze: Thank you, I liked it too! Kally: That sounds even more divine! I am so jealous of gals with vintage shoe sized feet!! Kathy: Yes they are warm, but Chicago warm… not sure. You might be better off with some wooly/cable/ribbed tights! Jenny: Yes it's been a bit parky! I only left the house to go to the shops and that was bad enough! Stephanie: I hear you… this dress does stretch though.. making it ideal! Laura: Ooh that sounds amazing in the extreme! Oops, missed Casey and reckless daughter: Thank you both ladies! What a lovely dress!And those booties! You wouldn't believe it, but just two minutes before I popped on here, I was admiring that dress on Able Grable. My Christmas outfit will be for the Southern Hemisphere summer – a pair of red high-waisted pleated skorts, a white chiffon top, and a pair of candy cane striped wedges. Thanks ever so for the pictures, as ever, looking good!! I'm working on Xmas day in the afternoon, I'll be wearing black trousers and a red blouse, the scartlet street I made for me. New Year is my thing, so will be wearing the Lutie- Mae!! Your hair looks just lovely in these photos as well…I like the dress. Its a glorious color. That certainly is a dreamy dress and looks lovely on you. I shall be wearing a dress my mother made me in a Christmas fabric that I chose. I ended up steering clear of fabrics with Santas and reindeer on them, much as I wanted something uber tacky.